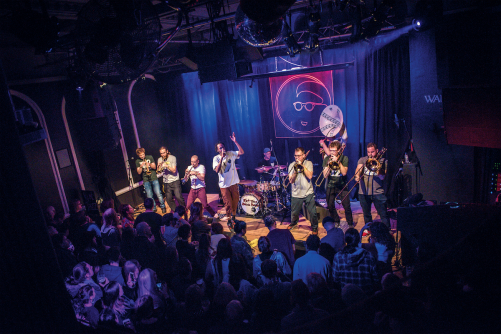 The 9-strong troupe is comprised of three trumpets, three trombones, drums, sousaphone, and is fronted by the prodigious MC Chunky. The sheer enjoyment and passion which emanates from these musicians is as infectious as it is inspiring. Be prepared for a unique, genre-bending exhibition of exhilarating music fit for any occasion, guaranteed to have every crowd on their feet – even Grandma will get up and dance! Drawing from Jazz, Hip-Hop, Drum & Bass, Balkan, Trap, Grime, Dubstep, Latin, Classical; they write and play whatever their hearts desire. And the same goes for covers, which range from Britney to Bon Jovi, Shaggy to Blink 182. This astonishing versatility and insatiable hunger to explore all corners of the musical spectrum has led to collaborations with a wide variety of artists, such as Swindle, Plan B, London Elektricity and Riz MC.